A wipes is an essential component in a mother life, especially when she has a new-born to handle. A wipes always comes to rescue, especially when you are out and the little one has messed his hands while eating a chocolate, during nappies changing sessions and even while traveling to a nearby park. 1. It is not always possible to wash and clean the baby with water, especially in the cold climate. A wipes is always there to help the mommy. 2. A wipe comes very handy when you have to travel. They are easy to carry and to use. 3. A wipe is the best pocket-friendly option to stay clean and hygienic. 4. Since wipes are clinically tested, they are totally safe to be used frequently. 5. Best, safe and easy option to clean new-born babies with wipes. 6. Using a wipe is very easy and convenient. 7. The wipes can also come very handy when you want to remove the makeup, especially eye makeup. 8. Baby wipes are the best toilet paper substitute for the toddlers. 9. Wipes are helpful to remove excess oil and lotion from little one and adult’s skin. 10. You can easily use a wipe for a quick cleaning of your little one’s hand, legs, and even face. The baby’s skin is very soft, delicate and fragile. It is must for the mothers to select the best and safe wipes for the babies. The market is loaded with all type of wipes which claim to be safe and delicate on baby skin. But, often many brands don’t keep up the promise and do more harm than good. In addition to it, in India major wipe brands are lotion based and makes use of heavy preservatives. This preservative can be harmful to the new-born skin. It is must for the mothers to select the safe wipes and avoid using lotion based wipes. with 98 % of water and has 100 % biodegradable fabric. Mother Sparsh Baby Water Wipes are totally travel-friendly, you can easily carry and use it anywhere. The packaging is done perfectly to keep the moisture intact and maintain hygiene. The main ingredient used to make Mother Sparsh Baby wipes is water. The wipes are made with 98 % water and made with plant-based fabric. It is perfect for the delicate baby skin. A new-born baby’s skin is very delicate, it is very important to take utmost care in selecting the best wipe. Mother Sparsh Baby Water Wipes is totally safe on the velvety soft baby skin since it is free from harmful preservative and alcohol. It is perfect to clean the new-born baby’s hands and legs. The Mother Sparsh Baby wipes is available for a very pocket-friendly price, I just paid INR 130 for 80 wipes. Perfect for everyday use since it is totally biodegradable and safe on the environment too. The Mother Sparsh Baby wipes is the only wipes which assure to prevent diaper rashes on delicate baby bums. Thanks for providing us the knowledge and also for inspiring us towards thos important issue. I will be using these wipes from today itself. The wipes looking soft and safe for little champions. I have been using these mother sparsh wipes since few months I received them. Must say .. they are the best. Love the cloth and natural feel. A wipe that is water content and dermatologically tested is obviously the best choice for a parent to use in babies. thanks for sharing the product. skin of little one is so delicate and water based wipes are the perfect solution to avoid rashes and skin allergies. Wow, such a great product for the little ones. Afterall they deserve the best care? 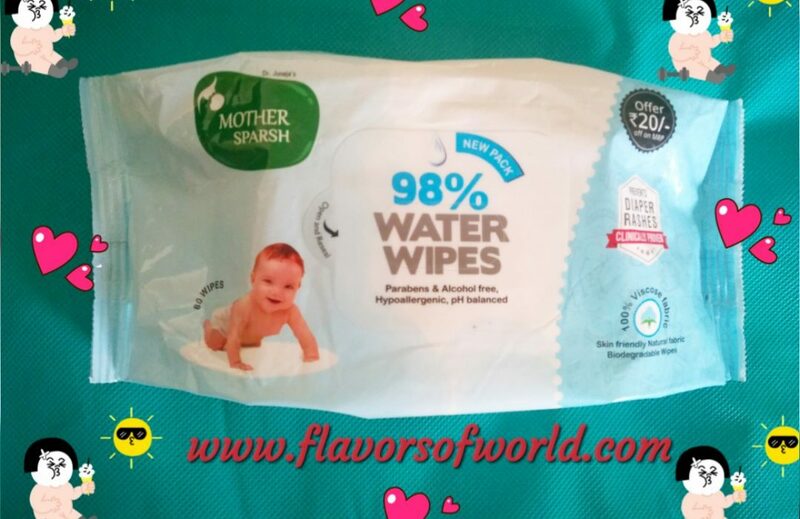 I just love mothersprash wipes… its soft, sufficiently wet and mildly fragnant.. perfect for kiddos. I agree! Water based wipes are light, gentle and good for baby as well as mommy! Mother sparsh wipes are really amazing! These seem to be glad great products. It is important to use the best options available when it comes to childcare. Thankfully my babies are now grown up but I do use baby wipes to take off make up or for a quick cleanse on the go as they are super gentle and moist . The real fact that these are water wipes amd free of polyester keeps me motivated to use these wipes for my child and even for myself. This wet wipes is ticking all the right boxes for me! As a mom I am relieved that the wipes are alcohol free and demagogically tested. Mothers were mothers, mothers are mothers and mothers will be mothers always. So they would choose the best for their child. These multipurpose wipes sound so good and non irritating for the skin. Even better they are dermatologically tested and biodegradable! Choosing the right wipes for kids is very important. I always go with trusted brands. Water-based wipes are the best. Looks like a great product for babies I will suggest these wipes to my sister who is recently became mommy. Amazing Mother Sparsh baby wipes. These wipes are best for soft and delicate skin of kids. Great thoughts. Yes completely agree with you on this. Mother Sparsh wipes are really good and safe for baby’s delicate skin. moisture retention and softness of this wipes is great. kids enjoy the touch and feel with good fragrance. the quality of wipes is so good and truly worth for the money value. also wipes do not dry in packet and gives long lasting usage option for baby care amd hygiene.